Carrying more than 2,200 kilograms of cargo, the capsule was installed to the Harmony module of the ISS at 8:26 a.m. EST (13:26 GMT) Dec. 17, 2017. This was the second time this particular Dragon pressure vessel made its way to the outpost. The hull is the same one used during the CRS-6 mission in the spring of 2015. CRS-13 began its trek at 10:35 a.m. EST (15:35 GMT) Dec. 15, 2017, from Cape Canaveral Air Force Station’s Space Launch Complex 40. Once it achieved orbit, it spent two days raising its orbit and catching up with the outpost. Using sensors and laser navigation, the capsule autonomously guided itself to close proximity with the station. The Expedition 54 crew monitored the final phase of the rendezvous and stood by to send a retreat or hold command in case any problems cropped up. However, the approach went by the book. Once the capsule was within about 10 meters of the Earth-facing side of the Destiny laboratory module, Expedition 54 crew members and NASA astronauts Mark Vande Hei and Joe Acaba used the robotic Canadarm2 to pluck the spacecraft from its free-flight drift. The capture was confirmed at 5:57 a.m. EST (10:57 GMT). According to NASA, the capsule contains various research experiments including an investigation that will demonstrate “the benefits of manufacturing fiber-optic filaments in a microgravity environment.” The Optical Fiber Production in Microgravity investigation was designed by Made in Space and sponsored by the Center for the Advancement of Science in Space. In the unpressurized section of the Dragon – its trunk – is 645 kilograms of external hardware. That includes a Space Debris Sensor that will be used to measure the orbital debris environment around the ISS for two or three years, according to NASA. The one-square-meter SDS will be mounted to the exterior of the station to provide “near-real-time debris impact detection and recording.” NASA says that the research could help lower the risks posed by space junk to both human life and critical hardware. Another item in Dragon’s trunk is the Total and Spectral Solar Irradiance Sensor, or TSIS-1. The sensor is designed to measure the Sun’s energy input to Earth and will be three times more accurate than previous capabilities. According to NASA, TSIS-1 will enable scientists to study the Sun’s natural influence on Earth’s ozone, atmospheric circulation, clouds, and ecosystems. 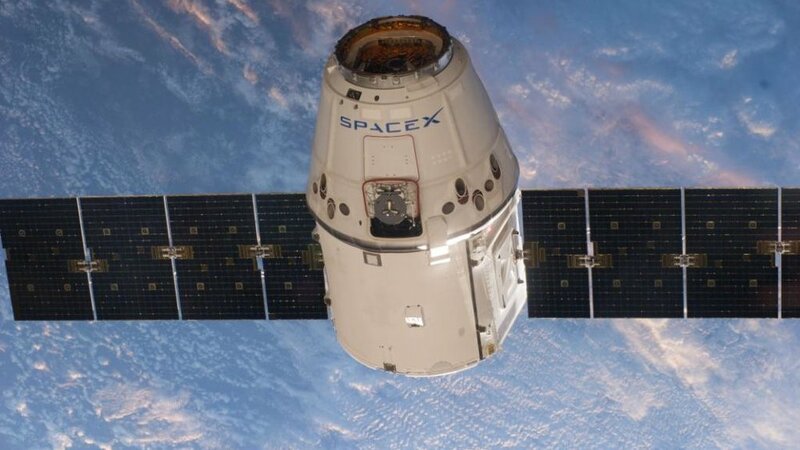 CRS-13 is expected to remain attached at the outpost until mid-January 2018. After all its cargo is unloaded, it will be filled with more than 1,600 kilograms of research, hardware, and crew supplies to be returned to Earth. After it is unberthed and released, the capsule will drift safely away from the ISS before performing a re-entry burn and splashdown in the Pacific Ocean, just off the coast of Baja California, to be recovered by SpaceX teams.